Being introverted naturally provides you with some great character traits that will make working as a freelancer easier than your extroverted counterpart. Even if you aren’t completely on the introverted scale, but tipping that direction, you’ll find the quiet solitude of working from home fulfilling. Here are 10 common introvert character traits that are beneficial to working from home as a freelancer. It’s not that you are depressed or afraid of people, introverts just need some alone-time to recharge. Being a freelancer with a flexible schedule allows you to take to your own space and clear your head whenever needed. If you find yourself zoning out, it’s time to take a break. Introverts often prefer to focus on one thing rather than trying to do everything. Being a freelancer generally means you have more control over your workload. If you find having multiple clients at a time is draining- cut it back to a minimum. Sometimes it may mean you need to re-think your rates so you can give your clients undivided attention and work with one or two people at a time. Most introverts are abstract thinkers and focus on the big picture rather than the gritty details. This mentality often leads to creative thinking. 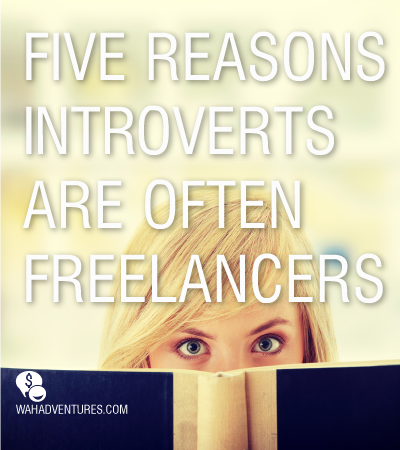 If you are a freelancer who works in the arts, you probably tend to relate to introverts. Your natural creativeness allows for more job opportunities. The most common freelancing paths include writing, graphic design and marketing. Avoiding people you know in the store, because the thought of chatting with them is, well, exhausting. Working online as a freelancer cuts the small-talk down to being nearly non-existent. Close your Facebook chat and you can limit your email responses to a few direct and to-the-point sentences. Too much going on around you can be overwhelming. Introverts perform best when there are less distractions. Working from home allows you to control your environment. Most of us are not entirely introverted and many of us bounce back and forth from introverted personalities to extroverted. I am actually a really social person who loves being around people. But I go through spurts of social highs and then I crash and need to be alone. Again, not that we are depressed or anti-social- Introverts simply need to recharge. Being a freelancer allows us to control and adjust our environments and working habits depending on our introverted needs. If being alone kills you and you need others around you to feel whole- then maybe you should reconsider working from home, at least not full time. This is so true! I’m a freelance writer and an introvert as well. I think the best part about working from home is that it’s comfortable- and I don’t mean physically. I think it’s mentally comfortable. There’s no anxiety and no pressure from anything other than deadlines. You nailed it! Great advice. Thank you!